to become one of Rock'n'Roll's earliest and best stars. and the first language he learned to speak was French. He first performed in public at age 10.
his writing partner on many of Fats' hit songs. and Fats Waller, among others. was identified with St. Peter in French-Catholic Louisiana and finally became La Bas. The record indicated a coming together of many years of New Orleans history and musical influence. The Fat Man was cleaned up a bit for his first commercial release, and it reached the R&B chart in 1950. Acccording to some reports, the song was a million seller. 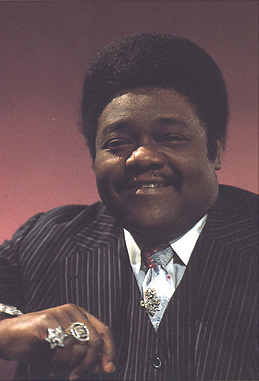 The Fat Man also became a nickname for Fats Domino. to become famous. It showed how his music had been influenced by that of Little Willie Littlefield. Fats had another R&B hit with Goin' Home in 1952.
and Domino's version on Imperial went to number ten. The song established both artists as stars. Fats could be heard in the background on the records of other artists, such as Joe Turner and Lloyd Price. He continued to write songs with Dave Bartholomew, many of which became hits. was Domino's highest charting record ever. to be the best Rock'n'Roll film ever made, The Girl Can't Help It, singing his hit Blue Monday. to launch the teenage singing sensation's career. and heard from Domino's agent some time later; thus was begun the songwriting career of Tommy Boyce. Fats has a smoky voice with a bit of a New Orleans-style accent, and he is very likeable. or maybe a great tenor solo from Herb Hardesty or Lee Allen. Fats' piano style is described as rolling boogie-woogie, with lots of triplets. but made things look easy. Fun, fun, fun. Fats Domino had his final top ten song in 1960 with Walking To New Orleans. he did old standards such as Red Sails In The Sunset, which was his final top forty song, in 1963. In 1968, he even did a cover of the Beatles' Lady Madonna. He also made some more films along the way, including Shake, Rattle and Roll, The Big Beat, and Jamboree. Fats played Las Vegas frequently, and at the Royal Festival Hall in London in the 80's. He had to leave a tour of Great Britain in the 90's due to health problems. Fats Domino still lives in New Orleans with his wife Rosemary, with whom he has had eight children. His awards have been many, including Grammy's Lifetime Achievement and Hall Of Fame Awards.